We have lots of award winning kids furniture at SimplyKidsFurniture, so I thought I’d showcase some of my favorites here! I think you’ll be quite impressed. I’m sure after you see these gorgeous pieces of kids furniture you’ll totally get why they’ve been given awards for excellence, innovation and design! Just so you know, all of our kid’s furniture, even the furniture that hasn’t won awards, is top quality and hand-picked to offer the best of the best in a kid’s bedroom or playroom. I say “Bravo!” To these Award Winning Kids Furniture Items! Any little girl will feel like she’s won an award if she gets this Levels of Discovery Princess Rocker. This is one well-built kid-size rocking chair that is as cute as cute can be! Not only is the design worthy of winning an award, but the special features make this rocker incredible! 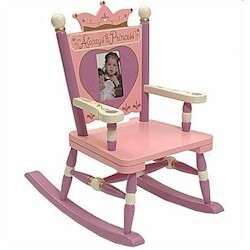 You can have your child’s name stamped below the seat and add your daughter’s picture inside the frame on the rocker’s backrest. It’s no surprise this beautiful kid’s rocking chair was awarded the Juvenile Product Manufacturer Association’s Innovation Award and iParenting’s Media Award. Designed to look like a futuristic chair from outer space, the Offi Kapsule Chair is the coolest! Not only is the shape really interesting, but this chair comes with a built-in storage area that your child can get to from the back. Choose between four fun colors including: purple, green, blue and orange. This chair is so unique and fun it can be inspiration for an entire modern room decor. It’s no wonder that this Offi Kapsule Chair was awarded the Silver Level Industrial Excellence Award! Go Offi! Now this is one awesome kid’s desk! 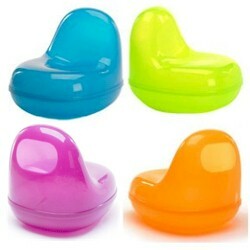 This colorful kids desk not only looks amazing in a kid’s bedroom or playroom, but it also satisfies lots of kid needs. It gives your child a place of her own where she can sit and draw, paint, color, study and more. The desktop is a chalkboard to add to the fun and there’s tons of storage space under the seat and in the colorful bag that hangs on the back. This desk can be assembled for left or right handed kids. With the adorable look, plus usefulness and storage space it’s no wonder that this kids desk was awarded the National Parenting Center’s Seal of Approval! It’s also the winner of Dr. Toy’s 100 Best Children’s Products. Now this is a desk that all kids deserve to have! 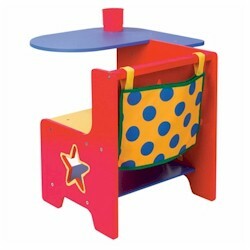 That’s just a very short list from the many award winning kids furniture items we have at SimplyKidsFurniture.com. To view them all come visit us today!